WE WANT TO SAY THANK YOU FOR ALL YOU DO! The people that donate to or volunteer with Habitat are people that want to make a difference in our community and make the world a better place. They are people that have the funds, the time and/or the desire to make this happen. These people are YOU. We exist because of you, and we want to say thank you! 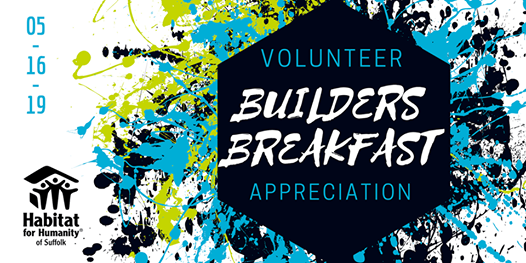 Please join us on Thursday morning, May 16, 2019 for a FREE breakfast and brief volunteer recognition ceremony. You will also have a chance to learn about some new and exciting programs rolling out this summer! 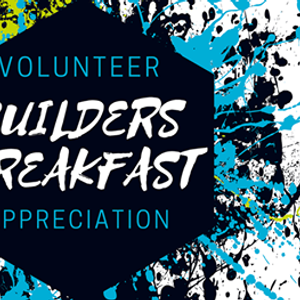 Even if you haven't volunteered with us yet, please come and learn about how you can get involved! More than building homes, we build communities, hope, and the opportunity for families to help themselves. Together, we help families build long-term financial security. With an affordable, stable home, families have more to spend on food, medicine, child care, education and other essentials. When you become part of the Habitat movement, you become a part of a larger group of Long Islanders that believe that every family deserves the stability and financial security that comes with homeownership. Questions? 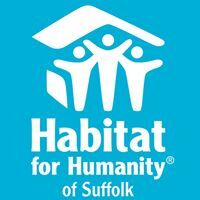 Please call Les Scheinfeld at (631) HABITAT x105, or email bGVzIHwgaGFiaXRhdHN1ZmZvbGsgISBvcmc=.